How to make sure your holiday is the best time of the year! At last, the holiday you've been longing for is just hours away. No matter whether you plunge into the hurly-burly of a pulsating city, pack your rucksack and climb a mountain, take a cruise or replenish your tanks with new energy on a white, sandy palm beach, the main thing is: escape from that daily grind and put your feet up! Before you can sniff the air of the big wide world, you've first got some preparations to make for the journey. But it isn’t just the swimming things that you have to pack, you must also think of measures to keep yourself healthy such as sun screen, vaccinations and putting together a first-aid kit. However, if you really want your holiday to be the best part of the year, you should think of your health. Read on for plenty of tips to help plan the holiday. Give me sun - but in moderation! The sun boosts our circulation and strengthens the immune system. But too much UV light can cause sunburn and harm the skin. Pack adequate sun screen with a high protection factor against UV-A and UV-B radiation. Apply the cream or the spray generously, always in the shade, and at least 30 minutes before sunbathing. To maintain protection, you should reapply the sunscreen regularly during the day on the beach. Don't forget to protect yourself even if it's cloudy. Always avoid the mid-day sun between eleven and three o'clock. Since these rays scatter far and wide, even the shade does not offer adequate protection. Feel free to feast on holiday. However, our gastrointestinal tract can sometimes be overwhelmed in distant lands. Boil it, cook it, peel it or forget it. The same applies to drinking water. Because tap water in many countries isn't fit to drink, you can only drink boiled or commercially filled water without any worries. Furthermore: no matter how hot it is, don't have any ice in your drink. Vaccinations and preventive medicines offer the best protection against diseases such as typhoid, hepatitis, yellow fever or malaria. The risk of catching an infection is highest in countries with a tropical climate. Find out about the conditions at your destination before you leave, for example, on the homepage of the Foreign Office or ask your GP or your health insurer. You can protect yourself further against malaria by not providing a target for the mosquitoes that transmit the disease. So wear long clothing whenever possible, sleep under a mosquito net, use anti-insect spray and light votive candles to keep the little beggars away. Medicine to treat diarrhoea and rehydration solution to compensate for the loss of fluids and minerals. Arrive feeling on top of the world! A successful holiday begins with a relaxing journey. Long journeys in aircraft, cars or trains can increase the risk of thrombosis. This occurs if blood clots form in a vein and block the vessel. 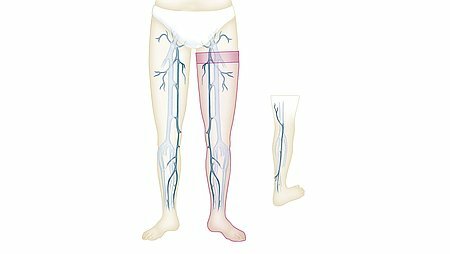 It occurs primarily in the veins of the legs. These blood vessels transport the blood from the feet back to the heart. They are helped by the so-called muscle pump: the alternating contraction and relaxation of the muscles whenever we move around. If we sit or lie around for a long time without sufficient exercise, this muscle pump cannot work. So the blood in the veins flows back to the heart more slowly and the risk of thrombosis increases. But there are many tips for minimising the risk of traveller's thrombosis. Buy some travel socks from your surgical appliance retailer. With their controlled pressure gradient decreasing up to the knee, they activate the muscle pump and thus the blood circulation. Furthermore, on long-haul flights, you should drink about twice the amount you normally do. Because, together with the dry air in the aeroplane, drinking too little can lead to the blood becoming too thick. Avoid "diuretic" drinks such as coffee, tea or alcohol. Water, fruit juice mixed with mineral water or herbal teas are better for you. Wear loose clothing and comfortable shoes. Exercises such as rocking and circling your feet will keep your circulation going. Take every opportunity to stretch your legs and walk around. Every muscle contraction promotes the return blood flow to the heart. So, nothing can stop your holiday now!